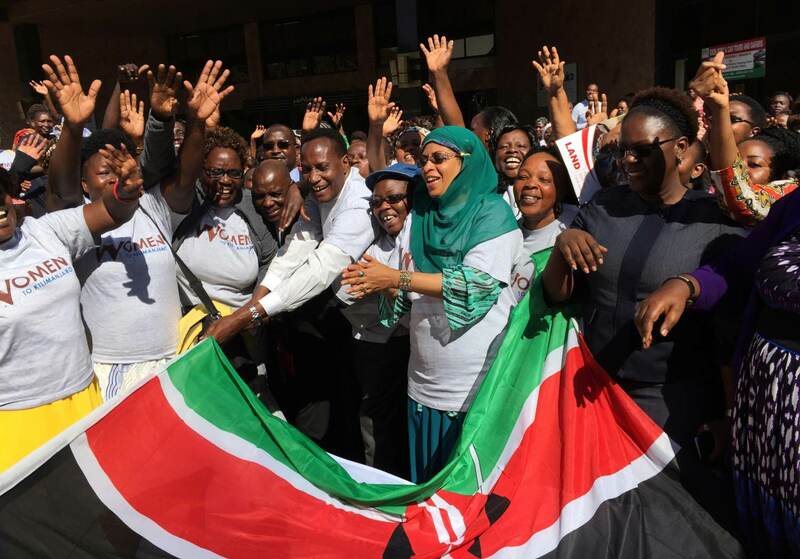 Everyone was energised by the trek of 29 women from 22 African countries up and down Kilimanjaro this month to raise awareness of women’s land rights, producing a charter of 15 demands on how to protect and enhance these rights. A powerful statement and great mobilising action. Such practical action comes amid a global desire to maintain the momentum created by the Sustainable Development Goals (SDGS) to improve women’s wellbeing and give them more control over their lives and future, as demonstrated by the U.N. Secretary General’s High-Level Panel on Economic Empowerment report. Under LEGEND, a programme by the UK’s Department for International Development that aims to improve land rights protection, knowledge and information, we capitalised on this to bring together land and gender specialists in the UK Land Forum last week to chew over the report. Hot on the heels of the Forum, I navigated the long corridors of the U.N. Food and Agricultural Organisation’s headquarters in Rome to attend the annual meeting of the Committee on World Food Security (CFS). I followed several sessions on land and women’s rights, looking particularly at the role of law in improving women’s land rights and food security. Immersing myself in the various discussions at the UK Land Forum and the CFS, I came away with some clear ideas of what needs to be done and – as always – a few more questions. So, what are the things that we all seem to agree on? First, getting changes in law that improve women’s (land) rights is an absolutely critical first step and can itself be difficult to get done. 155 of 178 countries continue to have laws, policies and administrative practices that discriminate against women (see Women, Food, Land: Exploring Rule of Law Linkages). There are some tools available to jumpstart the process of changing such laws – using the CEDAW(Convention on the Elimination of All Forms of Discrimination against Women) for example, to change seven discriminatory and anti-constitutional articles in Togo’s Family Code. Or using the GLTN’s 22 gender evaluation criteria to assess how gender-friendly a policy is to get the discussion going. Even more difficult is getting such legal changes implemented adequately. You can have the perfect law but if it doesn’t work in practice, it doesn’t take you very far. Putting laws into practice relies on social mobilisation, raising awareness of legal terms and conditions through public outreach and education, with well-crafted, targeted communication — and making the justice system work for women. But the most difficult of all is shifting social norms and attitudes – a more hidden issue and one that takes the longest time to change. Change is hard: people worry about losing out or getting labelled as troublemakers by their communities, or they may not be sure what change is possible. And it simply takes an awfully long time. I heard estimates of between five, 10 and 20 years needed for change to happen. At the CFS, a female farmer from Finland – a country with a good reputation for gender equality – said that there are still some negative attitudes to women using land in Finland, which are only gradually being eroded. How to deal with that? Education, training and “repeating the same message over and over again”. In this struggle, women can both make change happen and be a brake on change, depending on their perspective (which often depends on which generation they come from), their capacity to fight for change, and how confident they are that change will actually happen and help them. Women need to feel supported when they challenge the attitudes in their communities. One way to do this is to put some space between those most directly affected by the change – men and women – by using women’s organisations as a mouthpiece. But a mouthpiece that truly understands and represents those women’s concerns. On a recent field trip to Tanzania, I asked village councils in rural areas what they thought about joint titling of land as a way of strengthening women’s land rights, particularly for situations where there are family problems, such as death or divorce, or polygamous marriages. A ripple of discomfort went around the room and several people (ok, men) said that this could disrupt social relations and destabilise the community. We must remember: empowering women requires the inclusion of, and support of, men. Creating lots of champions of change among custodians of customary law to act as role models is one suggestion (and one of the demands from the Kilimanjaro Charter). And there are some actions, alongside education and awareness-raising, that can make men more inclined to accept things like joint titling – such as schemes offering discounted fees for joint titling in Nepal and Dar es Salaam that could be replicated. Overall, moving the dial on women’s land rights requires patience, grit and determination to keep going over a long period of time – by those individuals affected and those striving to support those efforts. It means that development partners, civil society organisations and other supporting agencies need to be in there for the long haul with a clear vision of how to support movement along the path of identifying the legal changes needed, getting them inserted into national law, implementing the law on the ground and – finally – shifting the attitudes of those affected by those changes.